The above quote was taken from an article written by Bruce Lee which appeared in Black Belt magazine in 1971. I have included it here because the words are prophetic. Prophetic, because, unfortunately, this is exactly what has been taking place over the last several years with regard to his own art, Jeet Kune Do. A rivalry has begun. A line of separation has been drawn. On one side is the group known as “Original JKD”, and on the other, the group known as “JKD Concepts.” The campaign of “for” and “against” is in full swing. While the members of the JKD Concepts camp call Original JKD people “purists”, members of the Original JKD camp respond by labeling the Concepts people as “dilutists.” Both sides issue statements and write articles which support and promote their particular philosophy and point of view while denigrating that of the opposite camp. The result is that, for the majority of the public, confusion now reigns supreme. The question is which side is right, and which side is wrong? The answer, with qualification, is both, and neither. For both the “Concepts” group and the “Original” group by themselves each only have one half of the total equation. They are, in reality, opposite sides of the same coin, locked in a struggle to see who gets to land on top. The purpose of this article is to examine some of the issues at the heart of this on-going and hotly-debated controversy and attempt to clear up some of the misconceptions and misperceptions which currently exist. It’s Just a Name – But Which One? So as he began to see that Wing Chun placed too much emphasis on close range or in-fighting (hand techniques) at the expense of long-range (kicking techniques) fighting, Bruce incorporated some of the more refined kicks of the Northern Chinese styles. And it is this hybrid form of Wing Chun that today we refer to as Jun Fan. Originally though, the term (Jun Fan) was used to designate the school – not art – of Bruce Lee. You see, the Jun Fan Gung Fu Institute was the name Bruce gave to the non-commercial establishments in Seattle, Oakland, and Los Angeles; and later the meaning again shifted somewhat to mean “the place where Jeet Kune Do trains.” Then once Jeet Kune Do was firmly established as an entity in itself, Jun Fan was looked upon as the art that Bruce Lee taught in Seattle and Oakland – which was more Wing Chun oriented with additional kicking techniques. Jeet Kune Do, then, is really a liberated form of Jun Fan; it encompasses much more. But Jun Fan is still a part of the total art. You can’t separate the two. The fact remains that, regardless of how philosophical or esoteric we want to get with Bruce’s statements such as, “ It’s only a name” or, “The name is not important. Please don’t fuss over it”, Bruce Lee did give the art and philosophy he developed a name. And in 1967 the name with which he christened his art and philosophy was Jeet Kuns Do. From 1967 until his death in 1973, in every magazine article, audiotape and television interview, Bruce Lee referred to his martial art as Jeet Kune Do. Do” listed, which dealt with various methods of shadow boxing (such as “all hand strikes” or “all kicks combined with footwork”). The problem with the preceding statement is that if you ask who refers to it now as “the JKD Concept”, you’ll find out it’s members of the JKD Concepts group. Many other people still refer to it simply as Jeet Kune Do. So how did the terms “JKD Concepts” and “Original JKD” come about? The primary factor concerning the rise of the word “Concepts” in connection with JKD stems from a promise which Dan Inosanto says he made to Bruce Lee concerning Jeet Kune Do as Lee was leaving for Hong Kong to pursue his film career. According to Dan, he promised Bruce that he wouldn’t commercialize Jeet Kune Do. In the late 1970’s, several years after Bruce’s death, Dan Inosanto began traveling and teaching martial art seminars. At these first seminars he taught Filipino Kali/Escrima. In fact, at the time he often expressed that he really had no desire to promote Jeet Kune Do on seminars, and that he would rather teach Kali, his Filipino martial art. He felt that not only was it a good art and had much to offer, but that it was more suited for the masses. Much to his dismay, however, many of the promoters of his seminars would play up Dan’s association with Bruce Lee as Bruce’s protégé, boldly advertising “JEET KUNE DO” or “BRUCE LEE’S JEET KUNE DO” on their flyers and in their brochures (sometimes in conjunction with the Filipino martial arts. over 100 participants). However, he explained, what he could do and would do was to demonstrate and share some of the concepts and principles which make up JKD. Dan also asked the promoters of these seminars that if they used “Jeet Kune Do” in their advertising, that they used the term “JKD Concepts”, because that is what he would illustrate, “concepts” of JKD but not JKD itself. A second factor in the rise of the use of “Concepts” as a suffix concerned students of Dan and/or Bruce who eventually expressed a desire to teach Jeet Kune Do. Dan did not want them to call it JKD, but decided that, as they had not made the promise to Bruce that he had, they were therefore not bound to it as he was. However, he asked those he gave permission to teach to call what they were doing “JKD Concepts” instead. He felt that by doing so he would not be breaking his promise to Bruce and both he and the individual teaching would be “covered”. A problem that many Original JKD people have with the term “JKD Concepts” is that they feel that some Concepts people now use it as nothing more than an “umbrella” term to cover whatever martial art styles they practice or teach. If you ask them what they’re doing, they’ll tell you, “JKD Concepts” – But if you ask them to explain exactly what concept it is that they’re doing, they can’t. They just keep telling you, “It’s JKD Concepts!” The problem that many Concepts people have with using the term “Original” lies in the fact that since the founder of the art has passed away, it becomes very difficult to pin down exactly what could or should be classified as “original”. What does the term “original” relate to? Are they talking about actual physical techniques, philosophical understanding, proper mental attitude, or what? In reality, both the suffix “Concepts” and the prefix “Original” are unnecessary semantic accessories. Zen, for example, is filled with “concepts” and “principles’. Does this mean that a person who practices it should refer to it as “Zen Concepts” or “Original Zen”? Of course not. They simply call it Zen. If someone studies Western Boxing, are they learning “Western Boxing Concepts”, “Original Western Boxing” or are they simply learning Western Boxing? Many JKD Concepts people like to use this last quote to support their argument that Bruce Lee was saying that JKD is not a style. But the word that many of these people tend to neglect, and which is vitally important, is the word “distinct”. When I began my training in JKD, it was very clear to me that I was not learning a “set” or distinct’ style, but rather the fighting principles, techniques, and training methods synthesized and put forth by Bruce Lee. The techniques we practiced and used were physical expressions of those principles. But make no mistake, there were still physical techniques that we had to learn and practice along with the principles. In studying martial art, one first has to learn a structure, along with the mental and philosophical attitude behind that structure. One also learns the tactics and strategies that are used with that structure. This has to be mastered first. Dan Inosanto used to tell me, “You cannot give a person total freedom right away. They have to understand structure first.” Following this, an investigation of one’s abilities and how to make them better continues, perhaps the way Bruce Lee did it, by exploring the “essences” of other martial art methods or styles. The important point is not to become “bound” by that structure, but to develop your own “personal martial expression”. If you talk to an “Original JKD” practitioner they will tell you that they believe that change and growth are necessary. But they will also tell you that they don’t believe in changing simply for the sake of change. Change, according to their point of view, should result in some form of improvement. This improvement might be physical, such as increased speed or power; or tactical, such as more deceptiveness in your motions; or even mental, such as developing a loose, pliable attitude towards training. 1) Who defines what is and isn’t improvement? 2) Who decides when and if improvements have been made? 3) Who decides what physical techniques are now “in” and which are not? In order to decide the answer to such questions, one needs some form of criteria by which to judge the material being presented. In JKD, the criteria one uses are such things as Simplicity, Directness, Speed, Power, and Deceptiveness. If you read the preceding quote carefully you will note that Bruce is not emphasizing and in fact does not mention physical techniques at all, but rather “qualities” which may exist in those styles. He even lists some of the qualities of various arts later in his notes. At the same time, he also included in his notes illustrations and verbal descriptions of physical techniques from various arts which he felt might be useful to what he was doing, or for further investigation at a later time. According to Ted Wong, one of the primary reasons Bruce investigated other arts was to discover what a particular style would try to do to him, and figure out how he could prevent them from doing it. In other words, the goal was to understand the opponent’s ‘playbook’. Some “Original JKD” people will refuse to even look at any other arts. They’ll tell you such things as, “I’m too busy refining what I’ve already got” or “If it’s not in Bruce Lee’s writings then it’s not JKD.” One only has to look at Bruce’s notes and research materials to understand that investigating other arts and refining what you have are both necessary, and must be done in the JKD way. Absorbing, however, does not mean simply adding. Absorbing something means it has to be brought into your own structure, which is the JKD you’ve learned. It then becomes an integral part of your structure. When copper and zing are combined, they form the alloy, brass. With brass we can no longer see copper and zinc even though we know they are still there. This a far cry from studying another style formally and then propagating that style as a manifestation of “JKD Concepts”. The question of how much adding and refining a person does is entirely a personal matter. If you are always adding, you will have no time for refining. Likewise, if you are too busy always attempting to refine what you have, you may not look and, as a result, may miss something that might improve you or what you do. In order for a person to understand the process that Bruce Lee was going through, one needs to understand what his goals and objectives as a martial were. He had a direction he was heading in, a level he wanted to achieve. 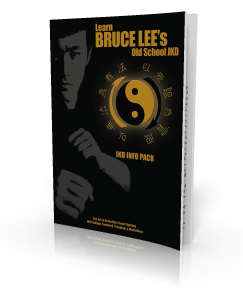 If a person can recognize the thinking and investigative processes that Bruce used to get where he wanted, as well as why he discarded, modified, or added to his JKD, they are in the position to follow his methods and do the same for themselves. Each may do so according to their influences and personal interests, but each will be using the JKD techniques of analyzing, modification, and refinement. And the end result will be that individual’s personal interpretation of Jeet Kune Do. This finished result, however, should not be taught as “Bruce Lee’s JKD”, but rather as the individual’s own JKD. Jeet Kune Do needs to be kept an open-ended art, an art that can lead the individual to their own truth. But it needs to be kept sober rather than elated by sticking to its principles and not wandering away from them. The plain and simple fact remains that all anybody purporting to teach JKD, be it “Original”, “Concepts”, or whatever, can offer, is their own personal interpretation of Bruce Lee’s art and philosophy. Whether one call this “Original JKD”, “JKD Concepts”, “Core” JKD, “Functional JKD”, or whatever, is totally irrelevant. I personally feel that it is unnecessary to tack on any kind of prefix or suffix. To do so denotes partiality and goes against the very core of the art’s philosophy. Jeet Kune Do is simply Jeet Kune Do. NOTE – The preceding article appeared in the December 1998 edition of “Bruce Lee – The Official Publication and Voice of the Jun fan Jeet Kune Do Nucleus.